The motor grader simulator from Immersive Technologies trains for proper operator behaviour directly impacting haul road quality. Operators are trained and assessed on correct technique with the ability for continual benchmarking to ensure performance stays at an optimal level. The motor grader simulator is now available as an interchangeable module, compatible with Immersive Technologies’ industry leading range of Advanced Equipment Simulators. “The grader is one of the most prominent ancillary machines having a direct and measurable impact on site efficiency. 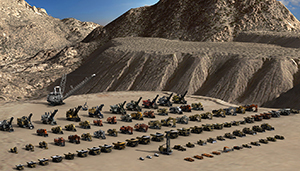 Our support for a broad range of equipment types allows our customers to utilize simulation training for the largest range of machines in the industry,” says Tim Radbone, Immersive Technologies Surface Mining Product Manager. The level of training effectiveness and realism is achieved in part through Immersive Technologies’ VirtualGround™ 3.0 which was designed to provide the most realistic material response and visual appearance. These elements are crucial details in support of effective training, up skilling and assessment of grader operators. The awareness provided to operators by Immersive Technologies simulation based training ensures they are working at maximum efficiency while minimizing equipment damage. It also ensures operators are able to avoid or respond correctly to hazards and potentially life threatening scenarios. “Improving the skill of grader operators results in less machine maintenance and tire wear as well as allowing higher haulage speeds, increasing loads per day,” says Radbone. Immersive Technologies offers the only fully supported simulation training solution including scheduled system upgrades, a dedicated mining training consultant network, an active simulator user community and regional support offices. Immersive Technologies’ new simulator module includes a complete replica cab of the Caterpillar 24M Motor Grader, with fully functional controls and instrumentation sourced directly from Caterpillar. The combination dash mounted instrument cluster and the CAT Advisor Messaging System provide key machine operating information and give the operator insight into the machine’s operation and maintenance needs. 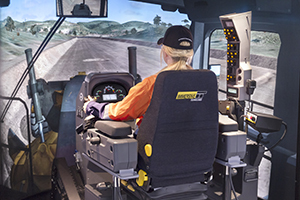 Immersive Technologies offers the largest range of simulated machines ensuring customers can provide training for the most diverse equipment fleet.